The US space agency is assessing a problem with one of two cooling systems aboard the International Space Station. Nasa officials say the situation is a potentially serious but not life-threatening. The system automatically shut itself down after detecting abnormal temperatures, said a spokesman. The two external cooling loops circulate ammonia outside the station to keep both internal and external equipment cool. Nasa told NBC News that the situation might require the station crew to perform an emergency spacewalk. "We are cleared for a contingency spacewalk if we need to do one," spokesperson Kelly Humphries told the channel. In a statement, Nasa said flight control teams had been working to get the cooling loop back up and running. They suspect a malfunction has affected a flow control valve inside the pump itself. In the meantime, the teams have moved certain electrical systems over to the second loop, but the space agency stressed that the crew and the station was in no danger. Some non-critical systems have also been powered down inside the Harmony node, the Kibo laboratory and the Columbus laboratory whilst engineers work to figure out what caused the problem and how to fix it. The statement said: "The crew is safe and preparing to begin a normal sleep shift while experts on the ground collect more data and consider what troubleshooting activities may be necessary." HOUSTON (KTRK) -- There is a major problem on board the International Space Station could become an even more serious issue if NASA engineers can't find a fix. NASA engineers have been working around the clock to find a fix for a broken cooling system pump on the ISS. It could take for engineers to decide the best approach to replace the pump module that failed. Yesterday, the pump module on one of the space station's two external cooling loops automatically shut down as soon as it reached its preset temperature limits. The Mission Management Team met this morning to analyze the options flight directors can perform from the ground. If the problem isn't repaired quickly, three emergency spacewalks could be scheduled. They are hoping that does not have to happen. Last time they used American suits on a spacewalk, an astronaut nearly drowned. But NASA is confident that they fixed that problem with those spacesuits. If NASA can't fix the problem quickly, it will be forced to cancel the Cygnus cargo launch next week, according to a source in mission control. This particular device that also had a problem back in 2010 was replaced and now the part in the replacement device is now in question. NASA officials says the pump module on one of the space stations two external cooling loops automatically shut down as soon as it reached its reset temperature limits. The external cooling loops are designed to both keep the internal and external equipment cool. This is actually a problem that they have had to deal with in the past. But it's not going to be an easy task getting it fixed. "This is a position we don't want to be in longterm and so the team in continuing to work through the faultry of what might be going on with this particular flow control valve and that work is ongoing as we speak," said Kenny Todd, NASA MMT Chair. We're told the good news is that the crew, along with the ISS, are not in any danger. The station commander is cosmonaut Oleg Kotov. Americans Rick Mastracchio and Michael Hopkins, Russians Mikhail Tyurin and Sergey Ryazanaskiy, and Japanese astronaut Koichi Wakata are aboard. The orbital outpost, the size of a football field and weighing nearly 1 million pounds, has been in orbit more than 220 miles above Earth since 1998. Earlier today, the pump module on one of the space station's two external cooling loops automatically shut down when it reached pre-set temperature limits. These loops circulate ammonia outside the station to keep both internal and external equipment cool. The flight control teams worked to get the cooling loop back up and running, and they suspect a flow control valve actually inside the pump itself might not be functioning correctly. At no time was the crew or the station itself in any danger, but the ground teams did work to move certain electrical systems over to the second loop. Some non-critical systems have been powered down inside the Harmony node, the Kibo laboratory and the Columbus laboratory while the teams work to figure out what caused the valve to not function correctly and how to fix it. The crew is safe and preparing to begin a normal sleep shift while experts on the ground collect more data and consider what troubleshooting activities may be necessary. NASA managers say they're still troubleshooting a problem with a coolant pump aboard the International Space Station — and although the crew is not in any danger, a commercial cargo flight might have to be postponed. A decision on the Dec. 18 launch of Orbital Sciences Corp.'s Cygnus cargo ship atop an Antares rocket will be deferred until Monday, said Kenny Todd, NASA's space station mission integration and operations manager. The cargo capsule is due to deliver about 3,200 pounds (1,400 kilograms) of supplies, spare parts and scientific experiment to the station, but during a televised update on Thursday, Todd indicated that the Cygnus flight could be put on hold if need be. This month's launch window runs until Dec. 21 or 22 at the latest. The coolant system problem centers on a flow control valve within a pump for one of the ammonia coolant loops that shed excess heat from the station. A valve malfunction caused the loop to shut down on Wednesday. There are two such loops, and NASA was able to shift most of the station's equipment over to the other loop as a backup. Some non-critical systems have been turned off as a precaution — but the reduced cooling capability means there's less of a safety margin on the station. Todd said mission managers don't want to risk having the Cygnus come in for a hookup under such conditions. "While we're sitting at one loop, we're somewhat vulnerable," he said. Engineers are currently troubleshooting the valve problem, and Todd said NASA would "kick the can a little bit" to see if the situation can be resolved remotely, using the software that operates the coolant system. If it can't, astronauts would have to take on a spacewalk to inspect the pump and probably replace it. "We have spare pump modules on orbit," he said. Todd didn't mention the potential time frame for such a spacewalk, other than to say "our intention would be to try to get recovered as quickly as possible." In July, Italian astronaut Luca Parmitano experienced a frightening problem with water welling up in his U.S.-made spacesuit, which led NASA to suspend spacewalks. Russian spacewalks, however, continued unhindered. On Thursday, Todd voiced confidence that the flooded-spacesuit issue would not reoccur. "We're a lot smarter now," he said. New measures were being put in place to inspect the U.S. spacesuits and make sure that the spacewalkers wearing them will stay safe, he said. Six spacefliers — three Russians, two Americans and a Japanese astronaut — are living aboard the $100 billion-plus orbital outpost, which has been occupied continuously since 2000 and is due to stay in operation until at least 2020. Repairs to the coolant system are among a set of "Big 14" maintenance issues that NASA and its space station partners expect to deal with regularly. Spacewalks to address coolant issues have been conducted on almost a yearly basis. The most recent repair operation, which involved the replacement of a coolant pump in May, was performed after only 48 hours of planning. But Todd indicated that there was no need to rush this time around. NASA unveiled this upgraded Payload Operations Integration Center at Huntsville's Marshall Space Flight Center on Wednesday, June 16, 2013. It is dominated by large LED monitors mounted on one wall showing station experiments, timelines, videos and still images. NASA payload operations specialists here worked through Wednesday night powering down and securing science experiments and results aboard the International Space Station after the loss of one of the station's two cooling systems earlier Wednesday. Science aboard the station is managed from the Payload Operations Center at Marshall Space Flight Center here. "We're still not sure" what caused a pump on one of the cooling loops to fail Wednesday morning, Payload Operations Director Donna Simpson said Thursday morning. "But there was no loss of science." The cooling loops are used to keep computer gear and other equipment from overheating in the station. When one loop failed, NASA switched some systems over to the second loop and closed the U.S. Harmony Node 2 module, European Columbus laboratory and Japanese Kibo laboratory. The astronauts are in no danger and crew quarters were not affected. The systems are also used to keep completed science experiments frozen until they can be transported back to Earth, Simpson said. NASA has several freezers of different kinds aboard the station, she said, and one of the priorities Wednesday was making sure science already done was protected. The Payload Operations Center in Huntsville is normally staffed 24 hours and day and seven days a week, so working overnight is typical. But nights like Wednesday have a lot more work to do. If the problem turns out to be a hardware failure, astronauts could go outside on a spacewalk to replace the failed module with a spare on board. Astronauts had to do that in 2010 when a similar problem happened to a cooling system pump. As of Wednesday night, NASA and its commercial crew partner Orbital Sciences were proceeding with plans to launch an unscrewed Orbital Cygnus space capsule to the station Dec. 18. That launch could be delayed if the cooling problem persists. The station is currently in a stable configuration and the crew is safe. The science and research mission continues aboard the station, and the science data collected so far is not at risk. Mission managers have deferred the decision on whether to proceed with or postpone the launch of the Orbital Sciences’ Cygnus commercial cargo craft until more is known about the flow control valve issue. Cygnus is currently scheduled to launch Dec. 18 from Wallops Flight Facility in Virginia and rendezvous with the station on Dec. 21. The Expedition 38 crew members also tackled a variety of other tasks Thursday, including maintenance work and scientific research. Flight Engineer Mike Hopkins began the day with some work on the Advanced Resistive Exercise Device, or ARED, which allows the crew to perform a wide range of weightlifting exercises in the weightless environment of the station. Hopkins later installed a jumper in the Quest airlock to provide contingency power to the airlock’s secondary shell heaters. He also prepared the U.S. spacesuits for some upcoming scheduled maintenance. Flight Engineer Rick Mastracchio deployed eight bubble detectors for the RaDI-N experiment, which seeks to characterize the neutron radiation environment of the station. Flight Engineer Koichi Wakata removed and stowed a NanoRacks platform. NanoRacks provides lower-cost microgravity research facilities for small payloads utilizing a standardized “plug-and-play” interface. Wakata also spoke with students in Kyoto, Japan, via the amateur radio aboard the station. On the Russian side of the complex, Commander Oleg Kotov continued unloading cargo from the Progress 53 cargo vehicle that docked to the station on Nov. 29. Kotov later collected micro-accelerometer data for the Identification experiment, which examines the station’s dynamic loads during events such as dockings and reboosts. Flight Engineer Sergey Ryazanskiy continued the replacement of fans in the Zvezda service module with low-noise units and used a sound level meter to measure the results. Flight Engineer Mikhail Tyurin conducted routine maintenance on the life support systems in the Zvezda service module. Afterward, he performed the Uragan Earth-observation experiment, which seeks to document and predict the development of natural and man-made disasters on Earth. On Wednesday, the first of two reboosts of the station took place to raise the station’s orbit and set up the proper phasing and trajectory for Russian vehicle launches and dockings in 2014. The 7-minute, 41-second firing of the ISS Progress 53 cargo craft’s thrusters also places the station in position for the arrival of Orbital Sciences’ Cygnus commercial cargo vehicle this month. NASA engineers continued efforts Sunday to regulate temperatures in one of two cooling loops on the International Space Station affected by the malfunction last week of a flow control valve in a cooling pump on the station’s starboard truss. A Flow Control Valve in the starboard Pump Module that enables the flow of ammonia to cool station systems stopped positioning itself properly last Wednesday, resulting in a drop of temperature in Cooling Loop A. That necessitated the shutdown of some support systems on the station. The temperature must be warm enough in the cooling lines to allow the system’s heat exchangers to dissipate excess heat from the station through the external radiators on the complex. The primary heat rejection capability for station systems shifted last week to Cooling Loop B that uses a fully operational Pump Module on the port truss. Meanwhile, parallel work is ongoing to either enable Orbital Sciences Corp. to launch its Antares rocket and the Cygnus cargo craft from the Wallops Flight Facility, Va. Thursday night at 9:19 p.m. EST on its first resupply mission to the space station, or for Expedition 38 astronauts Rick Mastracchio and Michael Hopkins to mount a suite of spacewalks beginning Thursday to replace the faulty pump. While the engineering work on the station’s cooling loop continued, technicians at Wallops prepared to load time-critical science cargo in the Cygnus spacecraft Sunday afternoon to preserve several days of launch opportunities beginning Thursday night. The current schedule calls for the vehicle fairing to be installed on the Antares upper stage around Cygnus on Monday. The Antares rocket and attached Cygnus are scheduled to rollout to the launch pad at Wallops in the wee hours Tuesday. Meanwhile, aboard the space station, Mastracchio and Hopkins continued to prepare their spacesuits and other equipment in the Quest airlock Sunday should they be called upon to conduct spacewalks to replace the Pump Module. After working for days without success to fix a cooling system problem that crippled the International Space Station, NASA announced today that a decision has been made to proceed with spacewalks in an effort to fix the problem externally. 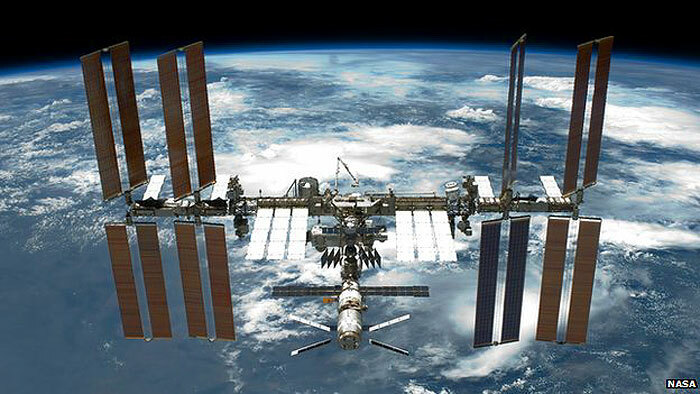 Teams, including legendary “Tiger Teams” that are tasked with fixing the most complex problems for the agency, have been working since last week to isolate a problem with a cooling loop that forced the temporary shuttering of three modules aboard the space station. Astronauts Rick Mastracchio and Mike Hopkins have been checking spacesuits, running through tool checks and procedure reviews in preparation of at least one and as many as three spacewalks that are scheduled to begin Saturday at 5:15 a.m. ET., NASA told ABC News. The first spacewalk is expected to run for roughly six hours. A second spacewalk is planned for Monday, and if necessary, a third spacewalk would be carried out Christmas Day. Though NASA has described the situation aboard the space station as urgent, they do not consider it an emergency to date and said the six-person crew is not currently in any danger. With the decision to proceed with spacewalks, NASA has delayed the launch of an Antares rocket with Cygnus, an unmanned re-supply spacecraft that was scheduled for launch Thursday at 9:19 p.m. ET at the Wallops Flight Facility in Virginia. The rocket and payload were rolled into place this morning, but the launch has been moved to January. NASA has scheduled a briefing on the forthcoming spacewalks for 2 p.m. ET Wednesday to discuss their next steps. NASA managers are postponing the upcoming Orbital Sciences commercial cargo resupply mission to the International Space Station to proceed with a series of spacewalks to replace a faulty pump module on the space station. 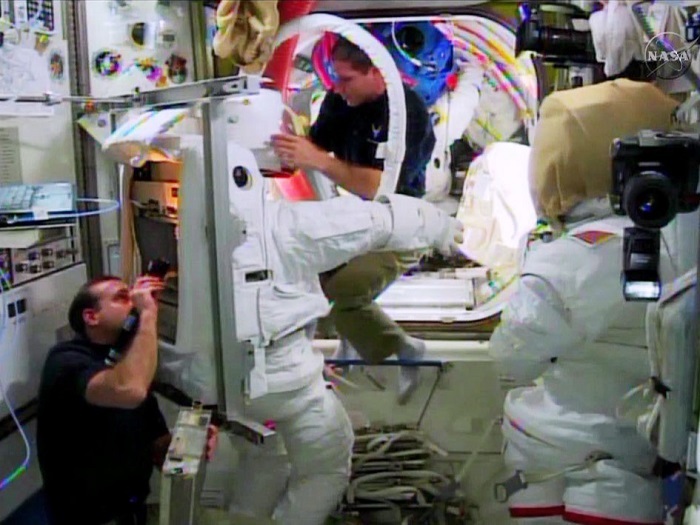 NASA Television will air a news briefing at 3 p.m. EST on Wednesday, Dec. 18 to preview the spacewalks. Orbital Sciences' Cygnus spacecraft, atop its Antares rocket, now will launch no earlier than January. The postponement of the Antares launch will allow ample time for the station crew to focus on repairing a faulty pump module that stopped working properly on Dec. 11. NASA currently plans for two Expedition 38 astronauts to venture outside the space station Dec. 21, 23 and 25. NASA astronauts Rick Mastracchio and Mike Hopkins will remove a pump module that has a failed valve. They will replace it with an existing spare that is stored on an external stowage platform. The pump is associated with one of the station's two external cooling loops, which circulate ammonia outside the station to keep both internal and external equipment cool. Each of the three spacewalks will begin at 7:10 a.m. and is scheduled to last six and a half hours. NASA TV coverage will begin at 6:15 a.m.
Astronauts aboard the International Space Station will venture outside on three spacewalks to replace a malfunctioning pump that has shut down part of the station’s cooling system, NASA announced on Tuesday. The space agency also postponed until January the launching of a cargo supply ship, which had been scheduled to lift off on Thursday. The first spacewalk is on Saturday, with the second on Monday and the third next Wednesday. Two loops of circulating ammonia cool equipment on the station. The problem started last Wednesday with a malfunction of a valve inside the pump, which is on one of the station’s exterior trusses. Flight controllers shut down that cooling loop. The remaining loop is sufficient for regulating the temperature of critical equipment, and NASA said there was no immediate danger to the six crew members. NASA managers want both cooling loops to be operating before the cargo ship is sent into orbit. The Orbital Sciences Corporation, a private company hired by the space agency to bring cargo to the space station, had rolled out its Antares rocket, carrying 3,230 pounds of supplies, to the launching pad on Wallops Island in Virginia. The launching will now occur no earlier than Jan. 13. During the spacewalks, each lasting six and a half hours, the NASA astronauts Richard Mastracchio and Michael Hopkins will remove the malfunctioning pump module, which had been installed three years ago, and replace it with a spare one. NASA also said it has fixed a problem with a spacesuit that led to the near-drowning of Luca Parmitano, an Italian astronaut, when his helmet started filling with water during a spacewalk in July. A faulty part has been replaced, and tests showed no further leaks. Flight Engineers Rick Mastracchio and Mike Hopkins continue preparing for a series of spacewalks to remove a failed pump module and install a spare pump module. NASA managers have planned for the first spacewalk to begin Saturday, the second on Monday and if necessary a third spacewalk on Christmas day. Station Program Manager Mike Suffredini, Flight Director Dina Contella and lead spacewalk manager Allison Bolinger provided more details during a spacewalk briefing at Johnson Space Center. Mastracchio has six spacewalks to his credit with 38 hours and 30 minutes of experience working outside a spacecraft. This will be Hopkins first spacewalk. The last time a spacewalk took place on Christmas day was in 1974 during the Skylab 4 mission. NASA astronauts Gerald Carr and William Pogue stepped outside the Skylab space station to retrieve film from a telescope and photograph Comet Kohoutek. Orbital Sciences is preparing to roll back their Antares rocket carrying the Cygnus commercial resupply craft back from the launch pad to its integration hangar. The Antares rolled out to the launch pad on Tuesday to protect for a planned Dec. 19 launch to deliver gear to the International Space Station. That launch has now slipped to no earlier than January so NASA can focus on replacing the pump module. Commander Oleg Kotov and Flight Engineer Sergey Ryazanskiy are also preparing for a spacewalk. This is a pre-planned spacewalk scheduled for Dec. 27 outside the station’s Russian segment. The duo will install a foot restraint; install medium and high resolution cameras; jettison gear from a pair of external experiments; and install a new experiment as well as a payload boom on the Zvezda service module. Orbital Sciences' Cygnus spacecraft, atop its Antares rocket, now will launch no earlier than mid-January. The postponement of the Antares launch will allow ample time for the station crew to focus on repairing a faulty pump module that stopped working properly on Dec. 11. 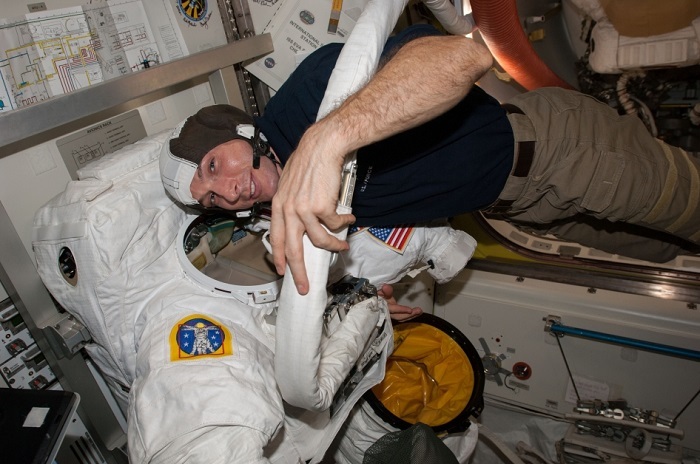 Expedition 38 crew member Mike Hopkins checks out the spacesuit he will wear outside the International Space Station on Saturday, Dec. 21, 2013. He and fellow astronaut Rick Mastracchio will conduct a series of spacewalks to replace an ammonia pump that is part of the station's coolant system. This will be Hopkins' first spacewalk, while Mastracchio has had six previous ones on STS-118 and STS-131.